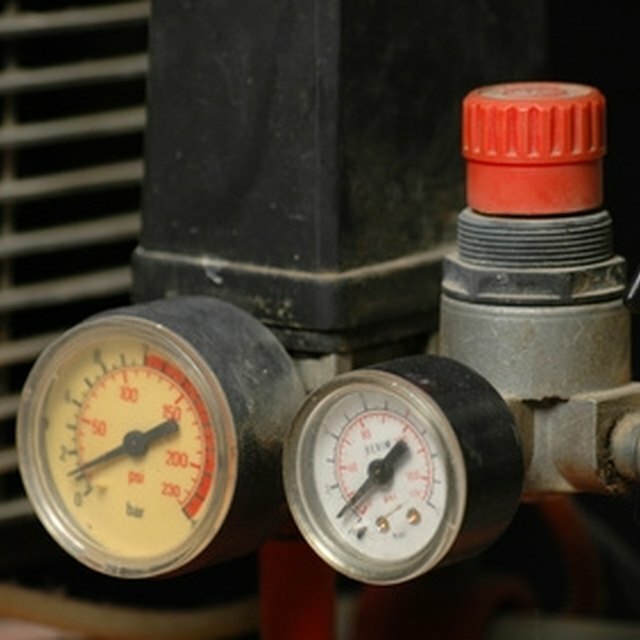 Air compressors are used in many environments, such as a garage, to provide air for tools that require air pressure to work. When an air compressor is installed you will need to run lines from the unit to areas where the tools will be used. AIr compresor lines have quick connect fittings for tools. This requires having the air hoses and hose fittings in place to properly run the lines from the air compressor. Plug the power cord for the air compressor into the electrical outlet. Locate the quick connect that is on the front part of the air compressor unit. This will look like a round plug. Find one end of the air hose and attach it to the quick connect on the air compressor. Push the fittings together until you hear a popping sound. If your air hose does not have a quick connect fitting one can be added. Run the air hose or air compressor line to the location where it needs to be used. Attach another air hose to the air compressor if there is another quick connect fitting available on the unit. Slide the gear clamp that came with the brass quick connect fitting over one end of the hose. Insert the barbed end of the brass quick connect fitting into the end of the air hose. Wipe the barbed end of the fitting with a soap and water solution if you are having difficulty getting the fitting on the hose. Move the gear clamp up the end of the hose until it is over the barbed end of the fitting. Tighten the gear clamp with the wrench to secure the fitting to the hose. Air hose can be purchased with or without a quick connect fitting attached. Second Chance Garage: Install That Air Compressor Right!